This view shows the building in context, beside Old Luss Road, which is on the left. The road branching off to the right leads to an area full of holiday lodges; compare NS3782 : Lodges at Cameron House, Loch Lomond. 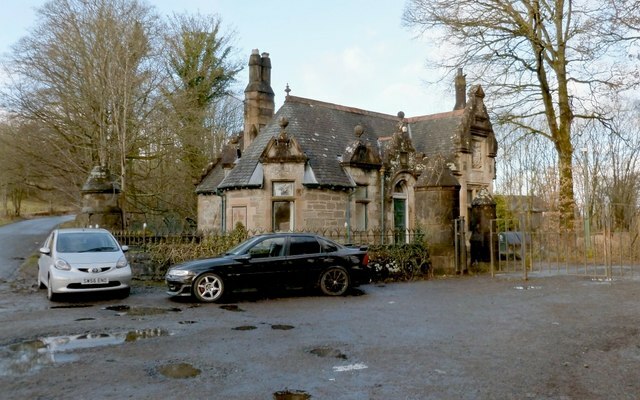 For a closer view of the building, and for links to close-up views of various architectural details, see NS3882 : South Lodge of Cameron House (or just click on the end-note title, below). According to its listed building report, the lodge is probably the work of John Burnet. A date stone identifies it as having been built in 1882. Various details on the lodge indicate an association with the Smollett family.